HAIR – BEFORE AND AFTER. Kerastase Ultime Elixir is recommended for nourishing each hair type, including hard to tame strands. Thanks to the cosmetic, hair becomes manageable, prone to set and easier to comb. Moreover, the product smooths, nourishes and provides moisture to distressed hair. It protects against action of aggressive factors deriving from the external environment, solar radiation and artificial substances which might be present in some washing cosmetics’ compositions. However, the greatest advantage of the oil is the performance that improves condition of hair and scalp. Before applying the product, strands were dehydrated, deprived of shine, weak and brittle as the hair bulbs were scantily nourished. 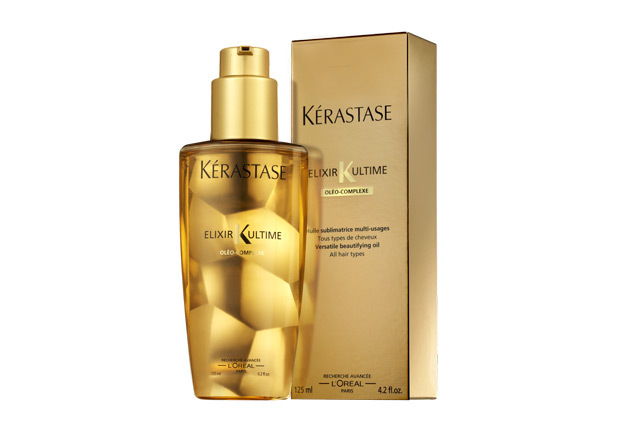 Kerastase Ultime Elixir contains four ingredients that regale scalp and hair with all the crucial substances they need. The ingredients are corn oil, argan oil, camellias oil and pracaxi oil. All of them provide healthy shine, deep nourishment, anti-free radicals working and smoothing. Furthermore, they take care of scalp by counteracting dandruff, premature greying and excessive hair loss. APPLICATION. Kerastase Ultime Elixir can be applied in a few ways. Firstly, the cosmetic can be put on hair before washing. In this way, the product removes all hair styling products (gels, mousses, hair sprays, etc.). Kerastase Ultime Elixir has to be washed down with a shampoo after 15 minutes since put on hair. Secondly, oil might be applied to wet hair to smooth it and provide moisture. This kind of application improves combability of strands. Thirdly, the cosmetic can be applied to towelled hair, right before blow-drying. Thanks to this procedure, hair gains additional protection from hot air and will be more manageable afterwards. Fourthly, the oil can be applied to ends in order to prevent them from splitting. RUNDOWN. Kerastase Ultime Elixir is an universal cosmetic – it performs perfectly on each hair type. The bottle contains 100 ml of the product, is handy, and facilitates distributing the cosmetic. The product is very efficient. It has delicate fragrance and is colourless. Best hair oil Copyright © 2019.